The 84-year-old who broke the Bank of England says he is giving up investing - and that this time he really means it. Hedge-fund pioneer Soros - probably the most influential and widely-respected individual investor this side of Warren Buffet - is apparently standing down for good. 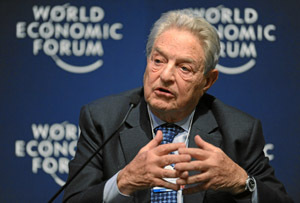 Soros stopped managing clients money in 2011 and told guests at a dinner he hosted at Davos last night that he was now handing over handling his family funds to chief investment officer Scott Bessent. ‘I have retired many times before but this time it’s final,’ he is reported to have said. ‘I am devoting all my energies to what I call my political philanthropy and the two activities are not compatible.’ So despite having previously quit almost as many times as Status Quo, it looks like he might actually mean it now. Soros founded his prototype hedge fund with Jim Rodgers back in 1973, but didn’t become famous until he made £1bn betting against the Bank of England on Black Wednesday in 1993. He concluded that the UK had entered the putative European Exchange Rate Mechanism with sterling pegged at too high a rate, and he was right - despite spending £2bn propping up the pound, and interest rate that rose briefly to 12%, John Major’s government rapidly conceded defeat. It was a drubbing from which a generation of the nation’s politicians took one key message - that a European currency union was bad news for the UK. So in the light of the Euro’s subsequent travails Soros may have deserved his billion pound payday for innoculating so many of our leaders against the idea. It was a situation similar to the one played out last week when the Swiss National Bank dropped the Euro cap on the Swiss Franc. In other words, exactly the kind of event which Soros looks out for: things which are unexpected but that in hindsight look obvious.